The 2016 IMWG consensus criteria for response and minimal residual disease assessment in multiple myeloma recognise that HLC assays can offer an additional means of monitoring oligosecretory patients (Section 25.3.5) . This is based on a number of studies, which are discussed below. In a study of 156 MM patients by Ludwig et al. , an abnormal HLC ratio was identified at presentation in all 18 oligosecretory patients (7 IgG and 11 IgA). Similar findings were reported by Boyle et al. . In a study by Young and colleagues  IgG and IgA HLC analysis was performed on serial samples from 8 oligosecretory patients (5 IgA, 3 IgG) with sFLC <100 mg/L. In all 8 patients, the HLC ratio was abnormal at presentation and changes in the HLC ratio were in concordance with clinical assessment during follow-up. An example of an IgAκ oligosecretory MM patient is shown in Figure 18.13. Although the patient initially responded to therapy (indicated by a fall in the IgAκ/IgAλ HLC ratio), the HLC ratio remained abnormal. 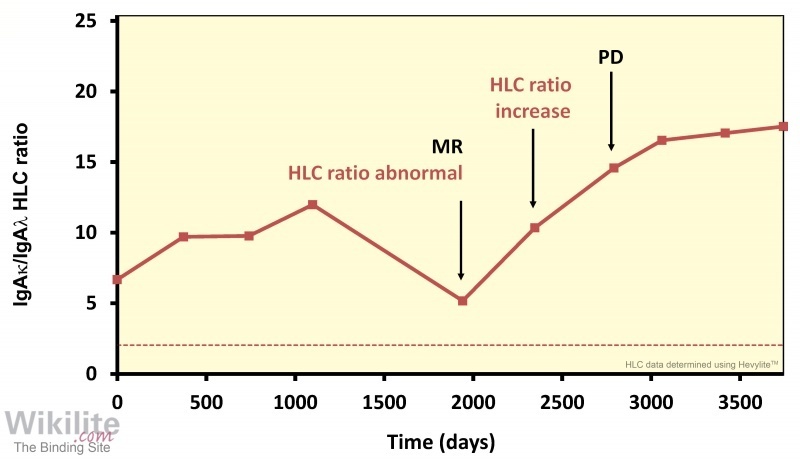 A subsequent increase in the HLC ratio suggested disease progression 445 days before a clinical relapse was confirmed.